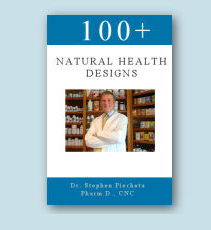 Dr. Stephen Peichota has authored the Book "100+ Natural Health Designs" which contains protocols for 100+ common ailments or diseases. The book is intended to be a quick and ready reference on how to alleviate these conditions. These protocols are not meant to be a replacement for generally accepted medical practice, but to be a complement to conventional healthcare. Considerable research was performed to create these health designs and they are validated by clinical studies and actual experience. Single copies of a specific health design or protocol for a single disease is availble at no cost to you, by just stopping in to visit us, or write us to request a copy. If you would like to purchase the book, it is available for sale for the cost of $19.95. To order please call 860-584-5071.